Of course Sheldon was going to be the first topic, what did you expect! But yes 2015 seen Sheldon's 1st birthday and living with him for a year. Of course by now you know I adore him and as I'm typing this he's laying on my legs watching what I'm doing, or thinking that he wishes I'd give him more food...who knows! This little fellow is my absolute favourite and I wouldn't change him for the world! 2015 was also the year that I realised the profession I was in was no longer for me! Shortly after leaving that I got myself a job in Boots and I have to say it was one of the best places I've ever worked and if you ever see a chance to grab and interview to get a job I'd highly recommend it. I 100% loved it and sadly I'm finished now but I would without a doubt go back if a job ever pops up again. Of course a highlight this year was also getting Aurora. She's definitely opposite to Sheldon as she loves being energetic and running around the whole house. Although the poor girl messed up her teeth (find post here) she has her operation on Friday to get the three out. She has started to get really loveable but at the same time when she has enough she'll push and shove you away until you're no longer near her. I turned 21 and my day was full of surprises! I was truly spoilt and even Sheldon bought me some amazing cupcakes that were super delicious! I got such lovely gifts and spent the day shopping until I couldn't carry any more bags. 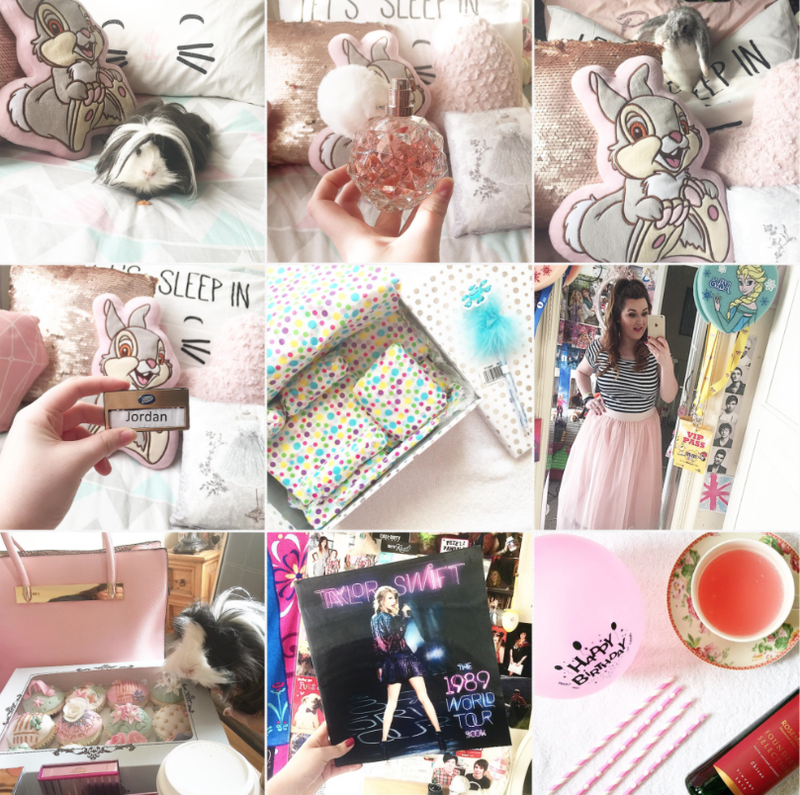 Catch up on my whole What I Got For my 21st here! The one thing on my Christmas list was the Ari by Ariana Grande fragrance however before it was even Christmas I was gifted it back in November from my work place because it's the best place ever. This fragrance has become my absolute favourite, the scent is so gorgeous and the bottle is so Instagram worthy I just adore it. Something that may sound a bit strange but made me happy was I started making my bed everyday and had it looking pretty and I just loved it. I'm dreadful when it comes to chores, making the bed being one of them but I really got into it in 2015 and when I did dress it I loved it. Definitely hoping to stick to this in 2016. I seen my absolute Queen Taylor Swift perform live for two nights in a row and it was honestly the best two nights. The second night especially was my favourite as I had VIP Pit Passes without even realising it until 5 minutes before the concert started. I would do anything to go back to that day, I danced and sang all night long and I just have so many wonderful memories from it. I also took the plunge in 2015 and decided to bleach my hair to go a lighter brown and then decided to add some baliage. I'm still absolutely loving it and don't plan on changing it anytime soon, if anything I'm thinking of lightening it a little more. Back to the second night of Taylor Swift I even managed to get one of her guitar picks from her guitar player which as you can only imagine made my absolute life! My blog turned one and it's honestly the longest hobby I've ever had. Yes I will admit when life got busy it did suffer but I haven't fallen out of love with it. I'm definitely planning on getting my schedule back on track from today and cannot wait to get back into it. During the year I did a box swap with one of my favourite bloggers Emmy from EmmysBeautyCave and it was so much fun to do. I absolutely adored everything she picked up for me and just look at how cute everything looked before I destroyed the tissue paper! Finally Christmas has been and gone and as always I was spoilt. This year I decided to treat myself to an iMac which I have wanted for years now and I am so obsessed with it now. Find out what I got for Christmas 2015 here! What were some of your highlights from 2015? Great post - maybe you should make it a semi-annual thing! Ties everything together so nicely :) I LOVE your guinea pig!!! i love how girly our instagram is, looks so cute. Your IG is stunning! Following ASAP!